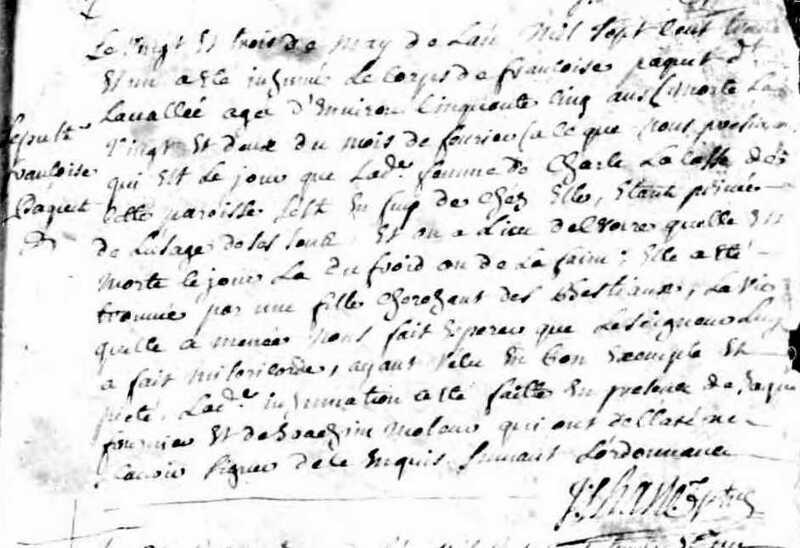 Two hundred and eighty-five years ago, my 7x maternal great-grandmother Françoise Paquet dite Lavallée died on or about 22 February 1731. A pious and Christian woman, according to her parish priest, she died in peculiar circumstances. Shortly before her twenty-first birthday, Françoise married Charles Lacasse on 12 September 1703 in Beaumont, a village on the south shore of the St. Lawrence River across from Quebec City. The couple had ten children, including Jean Baptiste (1713-1792), my ancestor. In early December 1730, Charles and Françoise’s 19-year-old son Charles died. His burial record does not state the cause of death, but his passing must have been a great loss to his parents. On 22 February 1731, Françoise flees from her home in an impaired mental state. The nearby woods are searched, but Françoise is not located. Could her son’s death have precipitated an emotional crisis and led her to lose her reason? A few weeks later, a young girl looking for domestic animals that had wandered into the forest happened across Françoise’s body. She appeared to have succumbed to the cold weather or from lack of food. Her funeral took place on 23 May 1731 in St-Etienne parish church in Beaumont. Parish priests do not ordinarily give so much information about a parishioner’s demise in a burial record. Father Chasle obviously felt compelled to document as fully as possible the circumstances of Françoise’s death. I am grateful for his attention to detail. 1. St-Etienne (Beaumont, Quebec), parish register, 1731, p. 4 recto, no entry no., Françoise Paquet burial, 23 May 1731; St-Etienne parish; digital images, “Quebec, Vital and Church Records (Drouin Collection), 1621-1967”, Ancestry.ca (http://www.ancestry.ca : accessed 19 April 2016). 2. 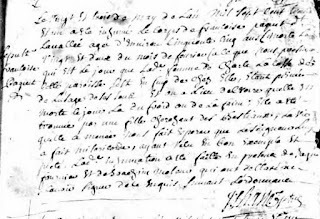 “Dictionnaire”, database, Programme de recherche en démographie historique (PRDH) (http://www.genealogie.umontreal.ca : accessed 20 April 2016), Isaac Etienne Paquet Lavallee – Elisabeth Isabelle Meunier, Famille no. 3173. 3. Cyprien Tanguay, Dictionnaire généalogique des familles canadiennes, 7 vols (1871–1890, reprint, Montréal: Editions Elysée, 1991), II: 575. 4. “Dictionnaire”, database, Programme de recherche en démographie historique (PRDH) (http://www.genealogie.umontreal.ca : accessed 19 April 2016), Charles Lacasse – Marie Francoise Paquet Lavallee, Famille no. 85852.